*Tip: I love these little egg poachers, from Sur la Table. My mom will be so proud...after years of doing the "Mad Vortex" (this crazy caulrdon of simmering water, stirred into a frenzy...yeah, crazy! ), I finally have my own little egg poachers. I only bought the two, so I could test them out...I'm sold! They're cute AND functional! 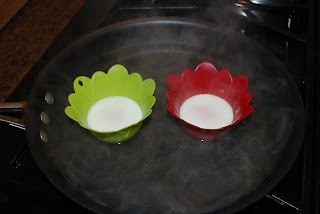 In a shallow pan, fitted with a lid, bring water (enough to reach 1/3-1/2 of the way up the sides of the poacher cups) to a boil and then reduce to a simmer.Crack eggs into the poacher cups and set the cups into the simmering water. Cover the pan with a lid (clear is nice, so you can watch the cooking process) and cook for 5-7 minutes, depending on your desired doneness (I cooked mine 5 minutes, for a runny yolk). Remove the poacher cups from the pan and, using a soup spoon, scoop out your eggs. Perfect! *To lessen the clean-up time, you can rub the poacher cups with a dot of EVOO. Not necessary, but helpful. The meaning of this is that you actually kill fat by eating coconut fat (also coconut milk, coconut cream and coconut oil). These 3 studies from major medical journals are sure to turn the traditional nutrition world upside down!